Episode 322 of Infendo Radio is now available for your listening pleasure. 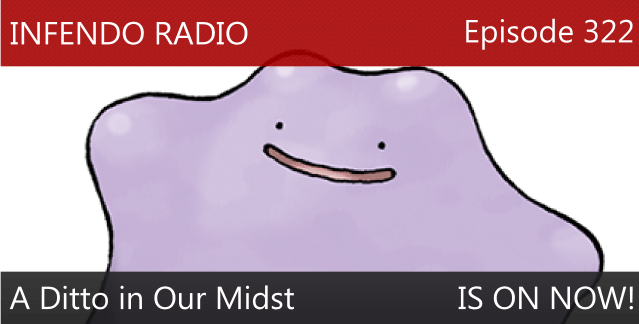 In this episode, Lewis Pugh, Harrison Milfeld, Colin Crompton and I talk about Nintendo news, including the upcoming “shocking” Pokemon announcement, the inclusion of online multiplayer in Fantasy Life, Ubisoft’s vow not to port M-rated games to the Wii U, and more. Our feature is an initial attempt to rank the top 5 RPG/strategy games out on the Nintendo 3DS, and this is where you, the listener, come in: we on Infendo Radio are generally fond of RPG/strategy games, but we haven’t collectively played all of the great games from the genre on Nintendo’s handheld, one notable example being Shin Megami Tensei IV. Your job? Let us know, in a comment below this post if you’re in your browser or in an e-mail to contact@infendo.com, what your top 5 RPG/strategy games on the 3DS are. Feel free to go into detail on one or more titles; this will help us to properly rank the 3DS greats two episodes from now. Apologies to those who recently sent in comments/questions; it may be the next one or two episodes before they are read/discussed, due to my forgetful nature. Written by: Holly Fellmeth on August 25, 2014.